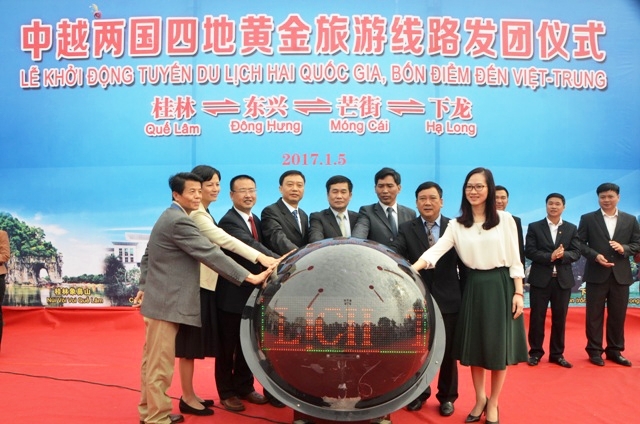 The ‘Two Countries – Four Destination’ tour, connecting Ha Long and Mong Cai in Vietnam with Dongxing and Guilin in China, was launched at a ceremony held in Quang Ninh province on January 5. The tour aims to promote cross-border tourism between Vietnam and China, as well as the common development of the four locales in particular. The launch ceremony was attended by leaders of Mong Cai city and the Tourism Department of Quang Ninh province, and China’s Guangxi Zhuang Autonomous Region Tourism Development Committee, Dongxing and Guilin city authorities. According to Nguyen Tien Dung, Vice Chairman of Mong Cai city People’s Committee, under the framework of the tour, travellers from the two countries will have an opportunity to enjoy a series of tourism products of each side. The province’s authorities and tourism sector will continue to create conditions, improve service quality and offer tours to meet visitor demand, he said. The event is considered as one of main activities in Vietnam National Tourism Year 2017. Two groups, with 60 visitors, from Vietnam and China carried out entry and exit procedures at the Mong Cai international border gate on the opening day. The number of Chinese visitors accounts for about 40 percent of the total foreign tourist arrivals to Quang Ninh province each year. In 2016, Mong Cai welcomed 1.6 million visitors.